The Setup sheet in the COC_Template file in EDGE can be used to change settings, set values and/or build a custom Chain of Custody (COC) template. This does not require editing VBA code or macros in Excel. The top portion of the Setup worksheet is dedicated to general settings for the COC. 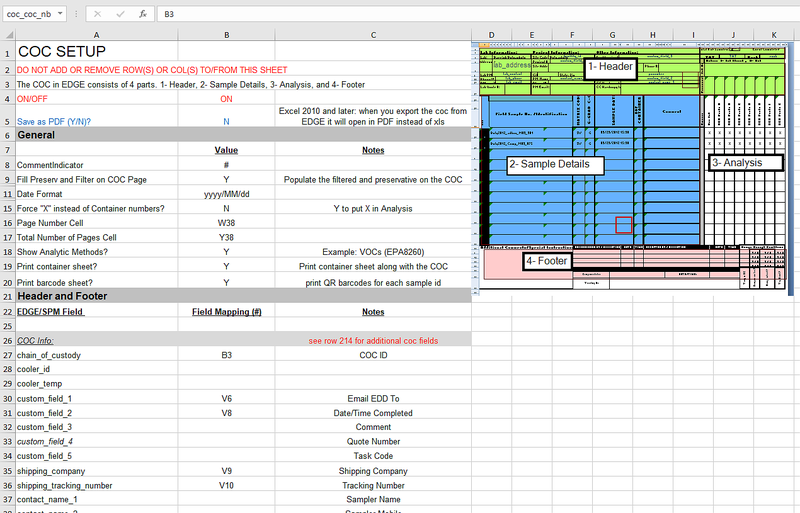 The Excel COC will immediately produce a PDF copy when opened. Force "X" instead of Container numbers? For example, to place the COC's name near the top of the printed COC, enter "B3" in the Value column under COC Info > chain_of_custody.